Fluorite is one of the most fascinating minerals in the world, with many intriguing properties. It is a material with important industrial applications, as well as a great favorite of mineral collectors. It is also popular as a gemstone, though it has to be cut, set and worn with care. In fact fluorite is such a special mineral that it was the official theme of the Tucson Gem & Mineral Society at the Tucson gem show in 2013. 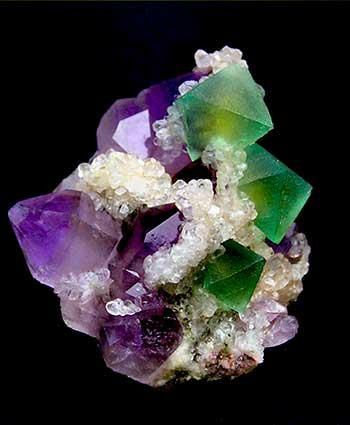 By chemical composition, fluorite is calcium fluoride. It is an isometric mineral that usually forms in cubic crystals, though octahedral and more complex isometric forms are seen as well. Because fluorite produces well-formed crystals in several different habits, interesting specimens are very popular with collectors. Cubic crystals are the most recognized, followed by the octahedral. Fluorite has perfect octahedral cleavage with 4 identical directions of cleavage, and cleaved fluorite octahedrons can be found in many mineral shops. Another distinctive characteristic of fluorite is the fluorescence that it displays under ultraviolet light. In fact fluorite was one of the first fluorescent minerals studied, and the very term fluorescence comes from "fluorite." The visible light emitted is most commonly blue, but red, purple, yellow, green and white also occur. The fluorescence of fluorite is thought to be due to mineral impurities in the crystal lattice. 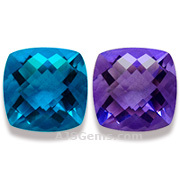 Fluorite has generated interest as a gemstone because of its wide range of colors and its attractive luster. Fluorite is found in nearly every color, ranging from purple and blue to green, yellow, orange, red, pink and brown. Banded multicolored specimens are common, and a color-change variety is rare but known. The color-change can be well-defined, typically showing a change from blue under natural light to purple under incandescent light. Because fluorite is a relatively soft material -- rating on 4 on the Mohs scale -- it is suitable mainly for earring and pendants. It can be challenging to cut because of its perfect cleavage and it has to be handled carefully when set in jewelry.